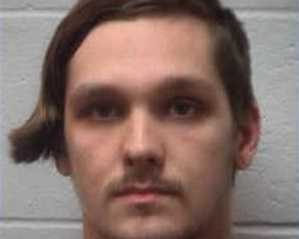 MCDONOUGH, Ga. — A Georgia teenager has apologized face-to-face to a pastor for vandalizing his church after admitting the crime to his father. The 19-year-old is now also in jail after turning himself in to the police. According to WSB-TV, Nathanial Rabideau approached his father to confess to defacing Seed Planters Church in McDonough, but says he thought the building was vacant. Danial Rabideau said that the fact that his son spray-painted satanic images inside of a church took him aback. As previously reported, earlier this month, the numbers “666” and the letter “A” were painted on the walls of Seed Planters, and a pentagram with a face inside was drawn with a pen, along with the words “Hail Lucifer” written both forward and backward. The door of the church had apparently been pried open, and chairs were flipped over. Rabideau went with his son to confess to the pastor of the church, as he felt it was only right to do so. “He said to me in a very, very soft voice that he was sorry, [that] this was a joke that had gone wrong. He thought the building was abandoned. He later went on to ask for me to forgive him,” Daunta Long, who leads Seed Planters, told reporters. Long’s church is new to the building and has not opened yet. The younger Rabideau then turned himself into police. He, along with another friend, have been charged with burglary, criminal damage to property and vandalism to a house of worship. His father says he is unsure whether he should allow the teen to remain in jail for a while or bail him out. “I hope this is a wake-up call for him,” he said. As previously reported, earlier this month, a California man was arrested after he was found responsible for satanic graffiti defacing Boulder Creek Community Church, as well as St. Michael’s Roman Catholic Church. “Hail Satan,” “666” and upside down crosses were painted across Boulder Creek Community Church, and similar language was written on the Roman Catholic facility, along with homosexual-related slurs. Police state that they were able to track down vandal Rollin Easley, 33, after he was captured on surveillance footage purchasing spray paint at a local hardware store. They then found that he had looked up area churches before committing the crime.